Democratic candidates steered clear of AIPAC. Was it business as usual or a mini-revolt? WASHINGTON (JTA) – The Democratic candidates are steering clear of AIPAC’s big policy conference, but celebrations by the pro-Israel lobby’s critics on the left may be premature. However, only Sen. Bernie Sanders, I-Vt., who said in 2016 that he “would very much have enjoyed speaking at the AIPAC conference,” explained why he wasn’t going this year in language that closely hews to MoveOn’s arguments for snubbing the event. “He’s concerned about the platform AIPAC is providing for leaders who have expressed bigotry and oppose a two-state solution,” his policy director, Josh Orton, told The Huffington Post. MoveOn’s reasons included AIPAC’s opposition to the Iran deal; its inclusion of speakers who the group says peddle Islamophobic rhetoric; alleged war crimes condoned by Israeli Prime Minister Benjamin Netanyahu; a deal struck by Netanyahu that could bring a far-right party into the Knesset; and AIPAC’s supposed refusal to condemn white nationalists in President Donald Trump’s orbit. But the conference won’t be a showcase for Democratic contenders for a perhaps more prosaic reason: AIPAC hasn’t rolled out the welcome mat. The truth is, AIPAC does not welcome candidates as speakers in non-election years. An AIPAC official confirmed the policy to the Jewish Telegraphic Agency, but would not explain it. A best guess is that when there are more than a dozen candidates in play, it’s too unwieldy. By the time March of an election year rolls around, it’s down to three or four, which makes the logistics easier. So why aren’t the other Democrats attending, if only just to schmooze? JTA asked a number of them, and is awaiting their responses, but one plausible reason is that they are campaigning. Until 2007, AIPAC allowed candidates to hold salons on the convention campus – no fundraising allowed, but an opportunity to meet and greet folks who might want to give once they get away from the convention. In 2007, the buzz at Obama’s salon was, well, buzzier than at Hillary Clinton’s, a harbinger of what was to be. So MoveOn’s “victory” list appears a little disingenuous. Harris, for example, teased her presidential candidacy at AIPAC two years ago and again last year – there are no definitive signs she is turning on the lobby. Delaney’s campaign told The Hill that he wanted to attend – he was “very disappointed” – but had a scheduling conflict. “We have attended every year since he has been in Congress and we very much look forward to being back next year,” his campaign said. But its complaints about AIPAC focus attention about fault lines on the left over Israel. It’s notable that some things Sanders and MoveOn object to about the lobby have changed since 2016, when Sanders was eager to speak to AIPAC – but much has not. MoveOn’s No. 1 reason – that AIPAC took the lead in opposing the Iran nuclear deal – happened in 2015, when the Obama administration negotiated the deal. So did the Israeli elections, when Netanyahu incurred the Obama administration’s wrath for referring to Arab voters in what seemed to be racist terms. Israel’s last war was with Hamas in the Gaza Strip in 2014, and before that in 2012. Netanyahu, moreover, is considered among his citizens to be among the Israeli prime ministers who have shown the greatest restraint in wartime. AIPAC has had speakers from Israel’s right who do not want a two-state solution, and in 2016 – the year Sanders thought it was a good idea to speak to the conference – The Nation singled out a number of speakers perceived as Islamophobic. By contrast, this year AIPAC distanced itself from a speaker who attacked Muslim lawmakers, and the speaker withdrew. In 2016, AIPAC did not condemn white nationalists associated with Trump (it did reprimand Trump for dissing Barack Obama), and it is true that unlike other groups, the lobby has not singled out administration figures like Steve Bannon or Stephen Miller. But AIPAC rarely speaks out on any issue that does not directly concern Israel – although it was, uncharacteristically, among the groups that expressed dismay in 2017 after Trump equivocated following the deadly neo-Nazi march in Charlottesville, Virginia. AIPAC – again, unlike other Jewish groups – did not directly condemn Netanyahu for his deal with the far-right Jewish Power party, but (again unusually for AIPAC) it did condemn the party itself. AIPAC is trying hard to cultivate Democrats, the party that still garners the loyalty of most American Jews, and explicitly backs the two-state solution, while Netanyahu and Trump have both retreated from it, and a number of the conference’s sidebar sessions are about how to get there. Its legislative agenda this year is devoid of the items that only Republicans are advancing, including proposals to recognize Israel’s sovereignty over the Golan Heights. The Iran deal damaged the relationship between AIPAC and Democrats, but not beyond repair. So what really has changed for Sanders? He was critical of the lobby in 2016, using its friendship with Hillary Clinton to attack her in a debate, but was also eager to engage. Perhaps the lobby is collateral damage from the broken relationship between Netanyahu and Democrats. It was bad enough that the Israeli leader dissed Obama in 2015 by speaking out against the president’s Iran policy in Congress, but his intimacy with Trump appears to be too much to bear for the party – certainly, the liberal wing that Sanders represents. There’s no question that Sanders’ surprisingly strong candidacy in 2016 made it easier for candidates this year to criticize Israel. This week, O’Rourke and Buttigieg took aim at Israeli policies, and Warren has done so as well. Sanders now posts campaign videos that speak of “apartheid-like” conditions in areas controlled by Israel. Harris, Sanders and Warren defended Rep. Ilhan Omar, the Minnesota Democrat accused of criticizing Israel and AIPAC in terms seen as anti-Semitic, while the party’s congressional leadership was preparing to condemn her. The same three senators, along with Gillibrand and Sen. Cory Booker, D-N.J., another presidential candidate, voted last month against an AIPAC-backed bill that would have protected states with laws targeting the boycott Israel movement. Each senator said the anti-boycott measure infringed on speech freedoms and that they opposed the Boycott, Divestment and Sanctions movement targeting Israel. It remains to be seen whether Booker, Gillibrand, Warren and Harris are comfortable with MoveOn’s boycott of AIPAC. Keep an eye on next year’s policy conference, when candidates will not be able to brush off AIPAC without explaining why – and might be less inclined to do so as they begin to pivot from pleasing the Democratic base and reaching out to independent voters. That’s a reality MoveOn appears to recognize – it has said that attending the conference will not be a litmus test in how it otherwise treats candidates. 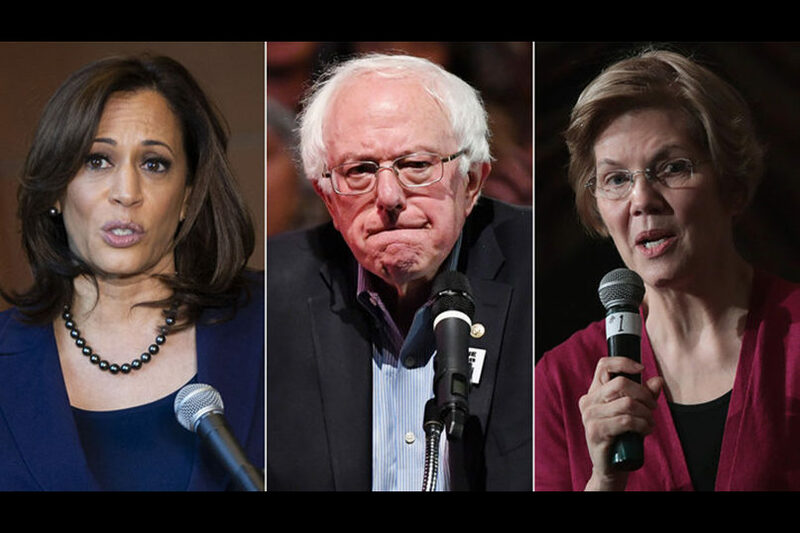 CAP: (l to r) Senators Kamala Harris, Bernie Sanders and Elizabeth Warren were among the Democratic candidates to steer clear of this year’s AIPAC conference. Only Sanders explained why.